You will need about 45 minutes of setup time to prepare the classroom or nature center. At least two long tables will be needed as well as a chalkboard, chalk and an eraser. Hand lenses should be available and some classrooms, science centers and nature centers are equipped with microscopes. At least one mushroom poster should be set up where you and the students can refer to it during the lesson. The tables should have books on mushrooms displayed and spore prints, both completed and in progress. Several methods of making spore prints should be demonstrated such as placing a mushroom cap on an index card; a paper cup with an index card with a hole for the mushroom to hang through; a glass slide with a mushroom cap placed on it. The rest of the tables should be covered with fungi, samples of mycelium and slime molds, fresh specimens if it is mushroom season and dried specimens if fresh ones are not available. Use as much variety as possible (one student counted 37 different kinds on the table), puffballs, dead man's fingers, and earthstars being the favorites. When the students enter the room, I like to have them stand around the table, but some teachers prefer that they sit in chairs at first. If it is a school class, the teacher will usually have given them an introduction to mushrooms. Each student gets a two sided handout, The Fungal Kingdom and There's Fun In Fungi for grades 4-8 and Mushrooms and Parts of a Mushroom for grades K-3. We talk about fungi for a few minutes and then I call on students to read the questions and answer them. I then let them pick up the mushrooms and look at them with a hand lens and we talk about their various features. I encourage them to ask questions and to compare the mushrooms to the pictures on the charts and in the books on the table. They usually have lots of stories to tell about mushrooms that they have seen. The questions on the handout can be answered for homework, if the teacher assigns it. 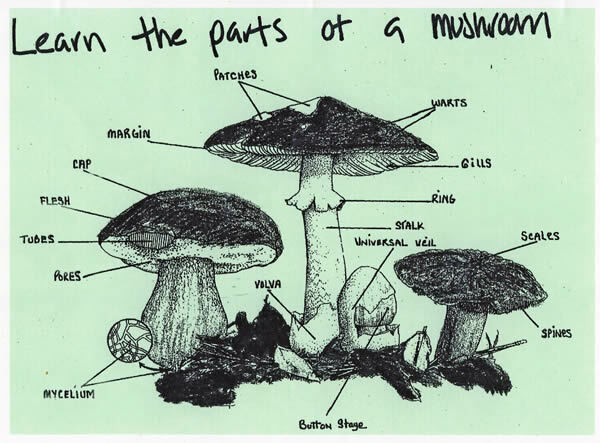 If there is additional classroom time (grades 4-8), I let each student pick a mushroom from the table and draw and describe it, using the second handout, Further Fungi Activities. We might also answer the additional questions on the handout, More Questions About Fungi. Some students might want to use the dictionary to look up the definitions of words associated with fungi that I have written on the board. Some students might want to look at the books on the table. For extra time (grades K-3), I would hand out pictures of mushrooms to color at their work stations or have them draw their own pictures of mushrooms and color them. An alternative follow up lesson (grades K-6), would be to take a walk in the woods, using the handout, Mushroom Workshop for finding certain mushrooms. They can just look at the mushrooms or you can have them pick a sample few, depending on the rules for the area in which you are walking. When they return from the walk, they can draw and describe them or they can pick one to make a spore print. I have also received wonderful thank you letters and drawings from the students. I have also used the handout, The Fungal Kingdom, with a High School Ecology class and Ecology Club. Additional material is enclosed in this manual for other lessons and for games about mushrooms.